Jacopo Tintoretto (c 1518-1594), Apparition of the Cross to Saint Peter (c 1556) (E&I 69), oil on canvas, 240 x 420 cm, Madonna dell'Orto, Venice, Italy. Image by Didier Descouens, via Wikimedia Commons. The late 1550s were a challenging time for Jacopo Tintoretto: he had established his art in the city of Venice with several paintings of renown, but hadn’t been able to tap in to the rich patronage enjoyed by his rival Titian. According to his biographers, and some surviving records of accounts, Tintoretto resorted to some extraordinary tricks to build up the business for himself and his studio. Most notable, at least among other Venetian painters, was his practice of undercutting prices. Sometimes this would mean painting for the cost of his materials, a ploy which he used on several occasions until he was securely established in the 1560s. 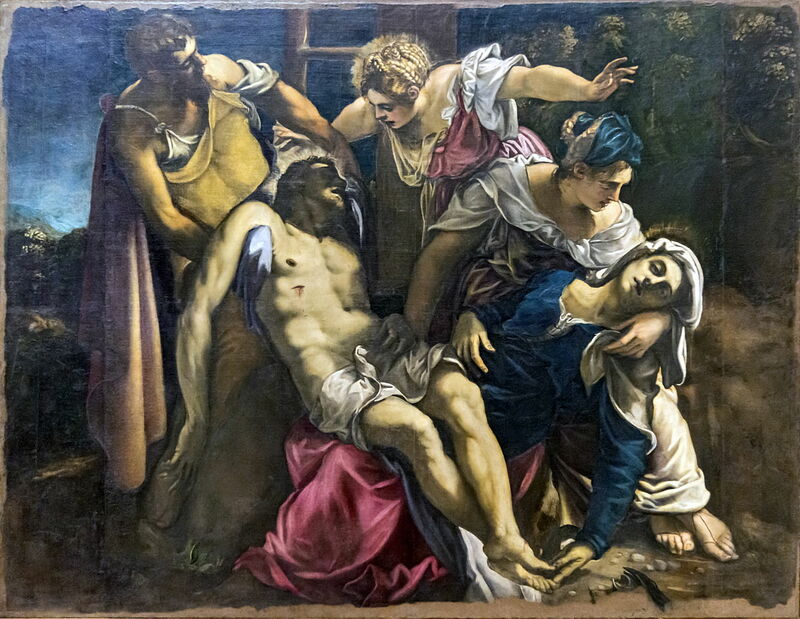 Jacopo Tintoretto (c 1518-1594), The Deposition (c 1555) (E&I 66), oil on canvas, 190 x 166 cm, Gallerie dell’Accademia, Venice, Italy. Image by Didier Descouens, via Wikimedia Commons. Following his Old Testament motifs of the early 1550s, his paintings of the late 1550s are predominantly drawn from the New Testament. Now in the Gallerie dell’Accademia, The Deposition (E&I 66) from about 1555 was painted for the Church of the Umiltà. It is a popular motif painted in traditional if not archaic style. Its figures follow Michelangelo, with the emphasis on drawing and form. Its two unusual features are the hair of two of the Marys, particularly that of Mary Magdalene at the back, which closely resembles that of Susannah (in the previous article). Jacopo Tintoretto (c 1518-1594), Saints Jerome, Louis of Toulouse and Andrew (1555-56) (E&I 67), oil on canvas, dimensions not known, Gallerie dell’Accademia, Venice, Italy. Image by Didier Descouens, via Wikimedia Commons. Saints Jerome, Louis of Toulouse and Andrew (E&I 67) is thought to have followed in 1555-56, for the Palazzo dei Camerlenghi, although this appears to have been designed by Tintoretto and painted by his studio. Saint Jerome at the left is shown in his traditional guise as a thin and bearded ascetic. 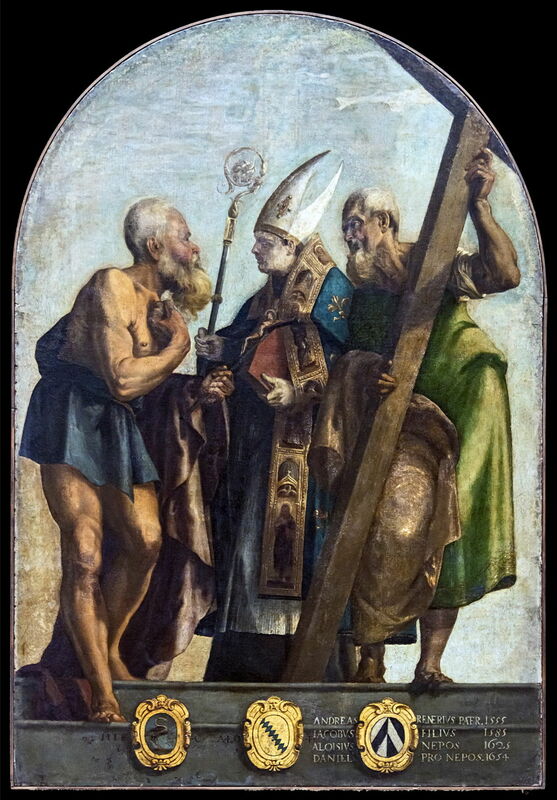 In contrast, Saint Louis of Toulouse wears full bishop’s robes and regalia, and Saint Andrew holds his cross. Saint Andrew has in relatively recent times become associated with the saltire (X-shaped cross, or crux decussata), which only started to become part of this saint’s iconography in the late Middle Ages. It is interesting that Tintoretto follows the older association instead. The inscription below records the family members remembered by this painting, starting with Andreas Renerius, the father, who died in 1555, confirming the date of its commission. Jacopo Tintoretto (c 1518-1594), The Presentation of the Virgin (c 1556) (E&I 68), oil on canvas, 480 x 429 cm, Madonna dell’Orto, Venice, Italy. Image by Didier Descouens, via Wikimedia Commons. In about 1556, Tintoretto painted the first of many works for the church in which he was to be buried, that of the Madonna dell’Orto in the north of the city. The Presentation of the Virgin (E&I 68) is the huge inner painting over which the next two works acted as outer shutters. Its style remains archaic, with extensive use of gold leaf on the patterned risers of the steps. You may not be familiar with this story, which is apocryphal: in thanksgiving for the gift of their daughter, Mary’s parents took her as a child to the Temple in Jerusalem, where they consecrated her to God. This is celebrated in a festival in both the Catholic and Orthodox churches. 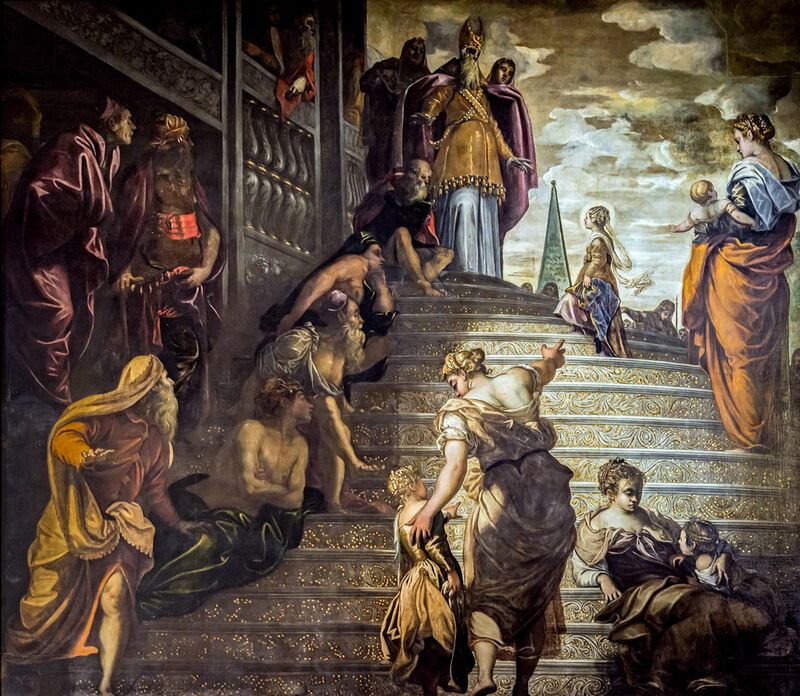 Tintoretto shows Mary as a young girl, reaching the top of these sparkling steps, and the large figure of a priest receiving her. The unusual angle of view heightens the visual impact. 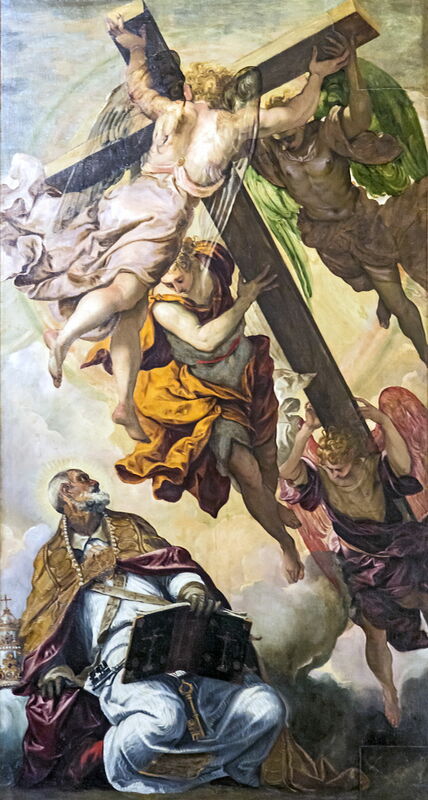 Jacopo Tintoretto (c 1518-1594), Apparition of the Cross to Saint Peter (c 1556) (E&I 69), oil on canvas, 240 x 420 cm, Madonna dell’Orto, Venice, Italy. Image by Didier Descouens, via Wikimedia Commons. One shutter shows the Apparition of the Cross to Saint Peter (E&I 69) (c 1556), another aerial fantasy with skilful foreshortening and flying angels, as they bring in a crucifix for a vision experienced by the saint. Saint Peter is readily recognised by the large keys seen hanging from his belt. 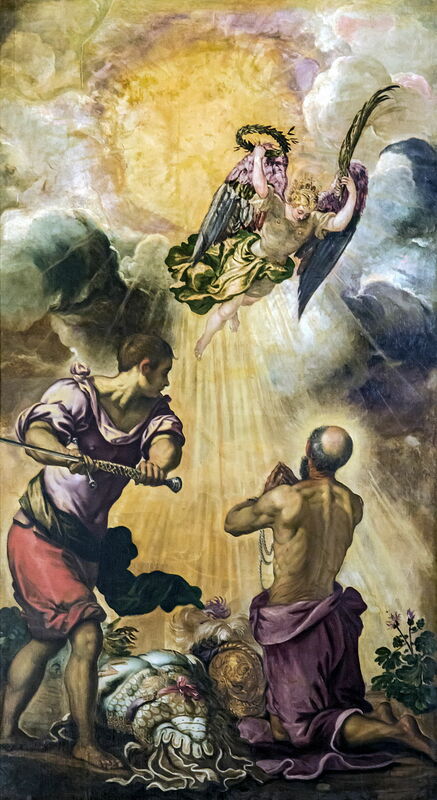 Jacopo Tintoretto (c 1518-1594), Beheading of St. Paul (c 1556) (E&I 70), oil on canvas, 240 x 430 cm, Madonna dell’Orto, Venice, Italy. Image by Didier Descouens, via Wikimedia Commons. On the other shutter is the Beheading of St. Paul (E&I 70) (c 1556). As a citizen of Rome, Paul had a right to a more ‘dignified’ martyrdom, and multiple accounts claim that he was beheaded rather than crucified. This later became embroidered into a legend, in which the severed head bounced three times, each impact giving rise to a source of water ,and the placename of St Paul at the Three Fountains. In this painting, Saint Paul kneels in prayer as he awaits the swing of the executioner’s blade. Up in the heavens is an angel ready to receive him, holding a wreath of laurel in his right hand, and a palm frond in his left. Jacopo Tintoretto (c 1518-1594), Birth of St. John the Baptist (c 1558) (E&I 73), oil on canvas, 270 x 204 cm, Capelle di Sant’Atanasio, Chiesa di San Zaccaria, Venice, Italy. Image by Didier Descouens, via Wikimedia Commons. 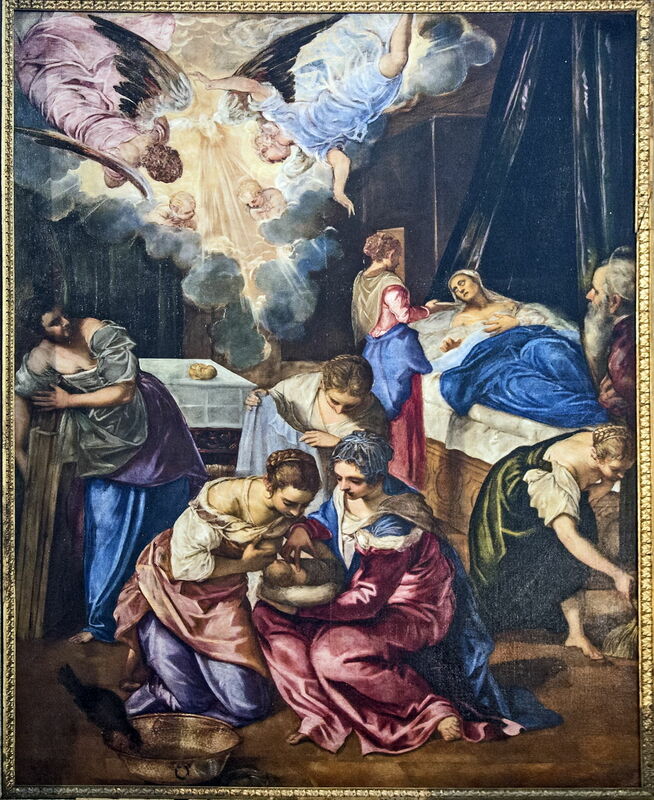 The last painting of this group is the relatively unusual Birth of St. John the Baptist (E&I 73) which Tintoretto painted in the late 1550s for the Capelle di Sant’Atanasio in the Chiesa di San Zaccaria, where it remains today. This too adheres to a very traditional style. Posted in General, Life, Painting and tagged history of painting, Michelangelo, narrative, painting, Tintoretto, Venezia, Venice. Bookmark the permalink. Fantastic! Thank you Howard. Always. Thank you. I am really enjoying this series myself – it is great to learn so much about Tintoretto.